On October 27, 2016, the Internal Revenue Service announced cost of living adjustments affecting dollar limitations for pension plans and other retirement-related items for tax year 2017. The contribution limit for employees who participate in 401(k), 403(b) and most 457 plans remains unchanged at $18,000. The catch-up contribution limit for employees aged 50 and over who participate in 401(k) and 403(b) plans remains unchanged at $6,000. Download a copy of the chart. 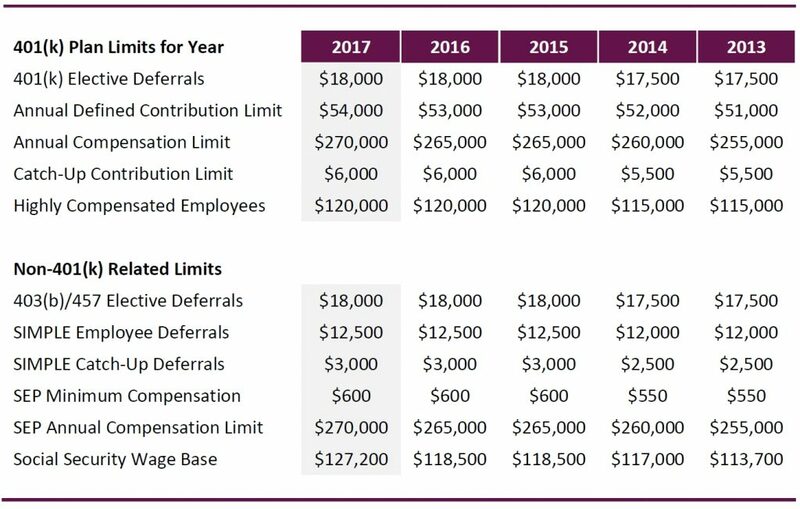 More detailed information regarding the 2017 pension plan limitations can be found on the IRS website.